After planting, sugarcane is harvested once per year for 4 to 6 years, depending on the soil conditions, climate, and plant variety. Soon after each cut, the roots, which remain buried in the soil (ratoon), sprout and grow again. In the Central-South region, where Renuka do Brasil is located, the crop season normally extends from April to November, when the cane reaches its maturity and the drier climate allows the entry of machinery in the field for harvest and transport. Harvest was formerly done manually and only after burning the leaves of the plant, in order to allow access and handling for the cutters. Renuka do Brasil has almost completely eliminated burning of fields for harvesting, through the use of modern mechanical harvesters. One ton of sugarcane when it reaches maturity has approximately 140 kg of sucrose. Transported from farms to mills Madhu and Revati by large trucks with two compartments, of the 'road train' type, sugarcane is chopped, shredded, and crushed through the mills operations. 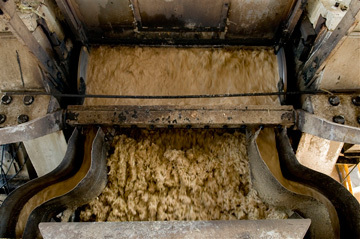 The juice obtained from the cane, with an average of 150 g of sucrose per liter, is then pumped to the treatment sector, where it's purified and concentrated. After that the fabrication of sugar and ethanol begins.